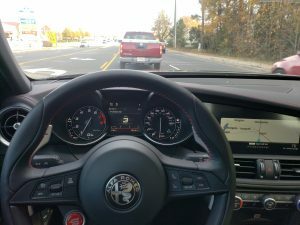 Driving the Alfa Romeo Giulia Quadrifoglio is an experience that any true Car Guy needs to check off the bucket list. 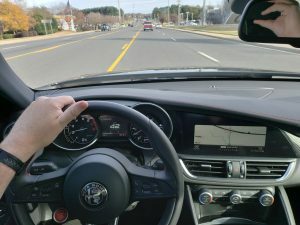 Sitting in the car, you find that you are both very comfortable, and held into place thanks to what are the most perfect sport sedan seats I’ve ever felt. Once adjusted and mirrors positioned, you buckle up and hit the start button located on the steering wheel. The button’s position is to remind you of just what it is you are getting yourself into. Things pop into mind like “Ferrari” and “Racing Car”, and those things are not far from the truth. The engine truly is derived from Enzo’s passion. That’s no joke. 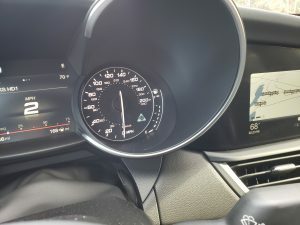 But this is a Sedan that is meant to be used as a car, just like any other… That’s why there are the A and N settings on the now famous Alfa Romeo DNA dial. I find that the “A” mode for Advanced Efficiency is a great setting for when it’s Cold and Wet outside, for when you are in Stop and Go traffic, or for when you need to get as good of a fuel economy as you can get. “N” is for Natural Mode, which is nice for when the Wife is in the car with you. This is Responsible Adult Mode. You are going to work, and you have no intention – at the moment – of blowing away things with SR or M Badges. You’ve got more important things to do… for now. “D” Mode is Dynamic Mode… Work is over and you want to have a bit of fun. Traction Control and all the safety systems are still on, keeping things Sane… But the Car is now feeling Hostile. It’s Aggressively growling and shifting later, letting the RPM’s get higher, and holding those revs to keep the Boost pressure up from those Twin Malice Pumps. Then we have the RACE MODE. 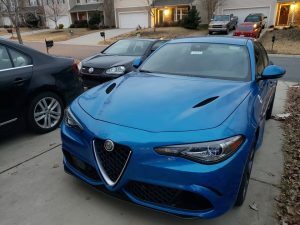 This unleashes the fury of a Pantheon of angry Italian gods, the exhaust system screams like a Meatloaf Album Cover and you can forget about the 14 speaker Premium Audio System… Because not you or anyone else in the car is paying attention to what’s on your Playlist. Everything in front of you is now rushing to get behind you as everything you see focuses down like Chewbacca just punched it into Hyperdrive. Torque Vectoring technology is battling to keep traction on the fat Perelli P Zero’s because your Stability Control and Traction Control just Surrendered. Five Hundred and Five of Zeuss’s Personal and Favorite Horses are straight up Pissed Off, so you better keep a firm grip on the suede leather-wrapped steering wheel. 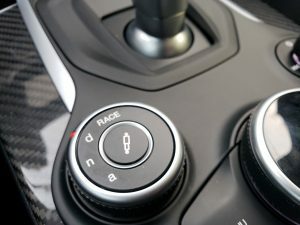 Mars himself will be disappointed if you left the 8 Speed ZF Transmission in Auto mode and didn’t put it in Manual because the Scimitar sized Shift Paddles are there for a Reason. They are meant to be used like weapons worthy of the Odyssey. The Top Speed of this War Chariot really and truly is 191 MPH which would make you a Public Enemy in all 50 States and every Western Nation. Be Thankful that Alfa installed the biggest baddest Brembo Brakes they could fit inside these Wheels, because You Will Need Them. They work as Advertised and can Haul your Kessel Run back down to the Posted the moment you see a car up ahead that has Red and Blues on the roof. 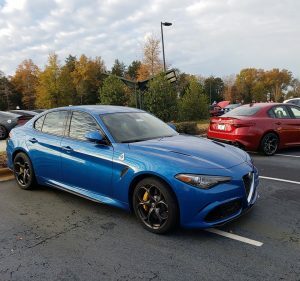 The Giulia Quadrifoglio is the most Fantastic Car you can drive on the Earth today that will let you take your wife and 2.5 Kids with you. And if you want to bring the Dog too, well, there’s the Stelvio Quadrifoglio as well. Previous PostVanderhall Venice: Constructive Criticism.Next PostSIG M11-A1 a Unicorn captured.